Valentine's Day and holidays in general are very motivating for young learners. When I was teaching my reading recovery students, they seemed to always choose holidays as writing prompts for their journals. It seemed they would write about Halloween for about a month, move to Christmas as soon as Halloween was over, and then begin writing about "Valentimes" day by mid-January. I soon learned to use the holiday hype to motivate my little learners. For some kids, it's very motivating to create a holiday note or card for a friend or family member. This gives the kids lots of writing practice-- and they don't even know they are working! 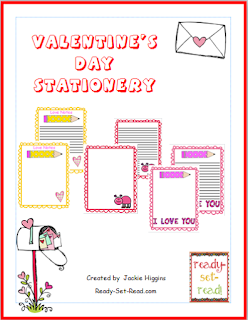 This month I have two new Valentine Themed Products for purchase in my Teachers Pay Teachers Store. I've created a fun Valentine's Day stationery pack. These are fun to print off and add to your writing center. There are both lined papers and unlined papers to meet the individual needs of your child. Add some envelopes and stickers for extra fun! The entire pack is available for $1.25 in my Teachers Pay Teachers Store. 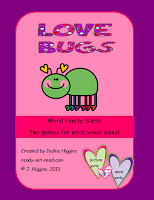 If you are looking for more Valentine's Day themed literacy activities, check out these Word Family Love Bugs. 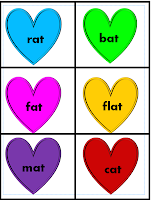 Love Bugs is a fun game for students to practice sorting word families. There are two word families for each short vowel. For each word family, there are both picture sorts and word sorts to accommodate the individual need of the child. The word families included are –an, -at, -en, -ed, -ig, -ick, -ot, -op, -un, -unk. Love Bugs love to eat hearts. Be careful, if you feed them the wrong word family, they’ll get love sick! You can purchase these in my Teachers Pay Teachers Store. 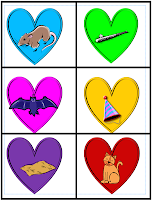 Do you have a favorite Valentine's Day teaching resource? Feel free to share links free or priced items in the comments -- you can share your own or your favorites of other bloggers. Very nice for the special class days around Valentine's Day for the students. I pinned this! Thank you so much for taking the time to make these nice printables.